You know that feeling you get when everything falls into place? Like a weight has been lifted, you feel confident and sure of yourself. We here at The Wary Worker are always striving for that feeling. In our case, though, it’s finding a real job that can be done from home AND earn you a living. But we know you may not be able to work full time. Family, restrictions, and other commitments keep you from working a full 40-hour-work-week but you need more than the “extra” money that the little jobs bring in. Well, we look for part-time work. So, our search was on. 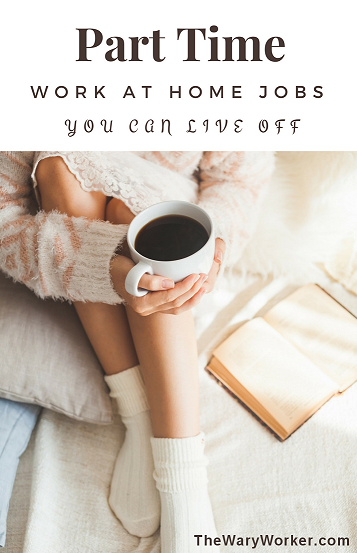 And we came up with quite a few ways you can make a living working part time…from HOME. Data entry and online research aren’t the only things you can do when working for Konsus, you can do Powerpoint presentations and graphic design and…well, whatever the client wants. As on on-demand freelancer, you have the ability to work as many hours as you want and they claim there is a steady flow of work. How much money can you make? It totally depends on you: how much you want to work. Be an online moderator with eModeration and make at least $15.00 an hour working part time. (according to glassdoor.com). They have a growing list of global-brand clients who seek talented community and social media moderators. Time Etc. and Worldwide101 hire Online Office Assistants to to do a variety of office-related tasks. Can you write? Do you like doing customer service? Do you think social media is fun? Working for either of these companies is a great career choice because you have a ton of flexibility. Work when you want and select the assignments that interest you. Try Global Test Market, a survey panel that pays up to $5.00 per survey. You can be an online stylist with Stitch Fix. They frequently look for Stylists to express their creativity helping clients discover their style. Although they don’t come right out and mention the pay, Glassdoor reports the salary is right around $15.00 an hour. Seasonal Jobs are great if you want to work a lot of hours for a short period of time. Even though you may work up to 40 hours a week, the fact the job is seasonal still gives you the flexibility you want. Places like Nordstrom, HSN and Williams Sonoma hire during the Thanksgiving and Christmas season while Blooms Today and Teleflora hire during all the holidays, including Valentines Day and Mother’s Day. Teach math online with Reasoning Minds, be part of the educational marketplace at Teachers Pay Teachers, help people learn another language with Rosetta Stone or help students with their homework with Chegg and work on your schedule. Not only is this line of work rewarding, you can really make good money. I have read that Rosetta Stone will pay up to $17.00 an hour and Chegg, tutors earn $20.00 an hour and can make up to $1,000 each month. A great career with a rewarding benefits, nursing jobs are always available. But are there any that can be done at home…and on a part-time basis? McKesson, Anthem, Cigna, and United HealthGroup always seem to have openings, including positions like Telephone Triage, Case Management, and Patient Care. Although most are full-time, they do occasionally have part-time positions that can be done virtually. If you have a way with words and can whip out a professional resume or cover letter, ResumeEdge will pay you. This is a freelance platform where you are paid a flat rate for writing resumes and cover letters. How much do you get paid? Well, Resume Edge is pretty tight-lipped but if their prices are any indication, you can make some decent money writing resumes on your schedule. For example, ResumeEdge charges $249.00 for a professional resume. If they pay you 50% per resume, you get $124.50. Don’t quote me on this though…I’m just speculating. While we’re at it, I want to mention You Mechanic. If you’re an automotive technician, you can make $40-$60 an hour as a mobile mechanic. This is an interesting concept: A customer books a service online with the You Mechanic app. and you will go to their home or business to service their vehicle. You have complete control on how often you work. To be completely honest, the search for the perfect work-at-home job never ends. But by carving out a few hours of your day you can un-tap the enormous potential to make a nice living working part time.